I must have woken up a dozen times during all the rain on Saturday night. Foremost in my mind was my reservation at Dukes Creek for the next morning. I get to fish Dukes a lot and I go whether it’s rain or shine. Conventional wisdom is that Dukes is best in the rain, so imagine my disappointment early Sunday morning when the rain was nowhere to be seen. No matter! It had rained about 3 inches so I figured there was plenty of water still in the creek and if I got lucky, there’d be plenty of color too. I left early to make the grueling 12 minute ride to Smithgall Woods, hoping to beat the urban hordes that were sure to be barreling out of Atlanta beating a steady path to my favorite piece of water. When I crossed the Chattahoochee at 75 Alternate my heart lept at the sight of muddy rushing water. I knew this to be good news! Sure enough, when I got to Smithgall at 6:55, there was already someone heading to the office to check in. I moseyed in and made some polite conversation while I got signed in and then headed to the parking lot with my game plan already formulating in my tiny brain. I got set up with a #10 pink San Juan Worm with a #18 rainbow warrior trailing about 14 inches behind and decided to try the culvert hole while I waited on the van to leave. My plan was to start at the bottom of Section 4 and work my way back toward the parking lot. A plan that was soon to be foiled. When I got to the culvert hole I honestly thought I may have underestimated the amount of water that had fallen overnight because there was a whole lot more running in the creek than I expected. And boy did it have color! I crossed the creek on the road and came down to fish from the far side. I added another couple of Dinsmores to my line, moved my indicator to the top of the leader, held my breath, said a short prayer and flung that joker (no I don’t cast well) up to the culvert opening, luckily getting it in the seam I was looking at. I didn’t have to worry about drag free because the water was moving faster than the roar it was making. With only 4 No. 1 Dinsmores on, my flies never saw bottom even though they were 2/3s of the way through the culvert hole. None of that seemed to matter. My indicator jogged right, I set the hook and on my first cast of the morning…Fish ON!!! Suddenly, I had an audience as a minivan coming down the road stopped to see what I had snagged in the creek. 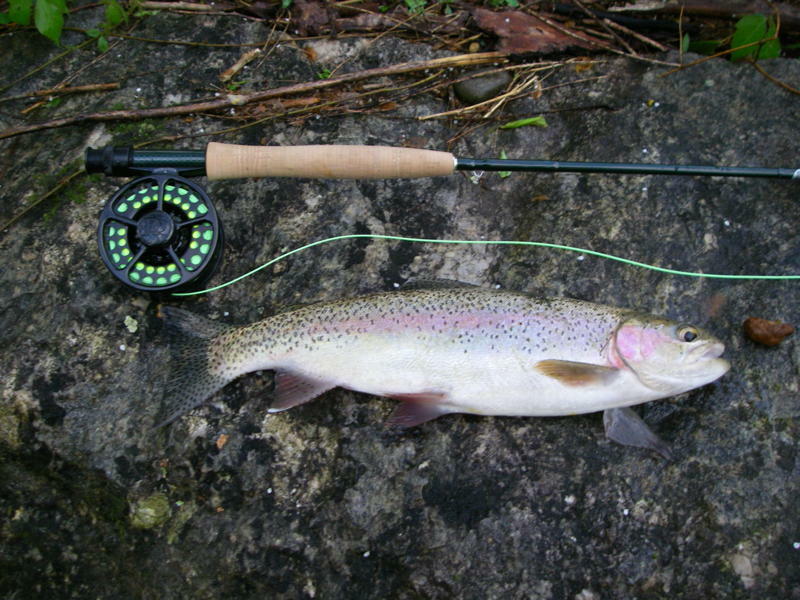 That fish put up a good fight, but I prevailed with my first fish of the morning….. a 15” rainbow resting comfortably in the bottom of my net. I caught 2 more rainbows in the next 4 casts and then something grabbed hold on my next cast and broke me off. It was then I found out I left all my flies in the parking lot. I checked my watch and it was 7:47 AM. The van wasn’t even warming up in the parking lot yet and I had 3 fish to the net. It doesn’t get much better than that. I walked back to the parking lot, picked up my fly box and headed back to the culvert where I caught 2 more fish and decided I was just going to stay on Section 1. To make a long story short, I landed 9, lost 6 including 3 that broke me off and missed a couple more. All but 2 of those fish took the rainbow warrior and all of them put up good fights, many giving aerobatic displays. The first fish was my longest for the day though I had one about 17” go airborne twice before breaking me off on a root in a hole next to the bank at the Swimming Hole. I was the only one on Section 1 Sunday morning. I finished fishing at the cable crossing at exactly 11:30 AM. It was great day of fishing without a drop of rain in the sky. Once again, Dukes proved to me to be the best water within a 15 minute drive from the house. I hate it for all the folks who had reservations but didn’t come because of all the rain the night before. Next time, forget the weather and enjoy one of the streams that makes north Georgia a year-round flyfishing mecca. Hope to see you on the water some time.